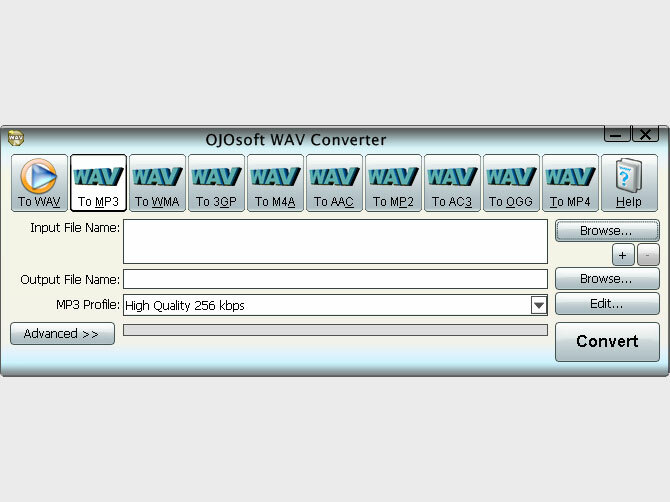 OJOsoft WAV is an outstanding and professional audio convertion tool for you. You can not only convert WAV files from video/audio files but also supports converting WAV files to other audio formats, such as MP3, WMA, M4A, AAC, AC3, OGG, 3GP, MP4 etc. It supports batch conversion with a task list. Have option to select bit rate, audio codec, sample rate etc. Enjoy your digital life whenever and wherever you like by using OJOsoft WAV converter. Convert all popular audio files to WAV format and convert WAV files to audios. 3. Support converting WAV files to other audio formats, such as MP3, WMA, M4A, AAC, AC3, MP2, OGG, 3GP, MP4 etc. 4. Unmatchable converting speed, wonderful output quality. 6. Have option to select bit rate, audio codec, sample rate etc. 7. So easy to modify the name and path of output files. 8. When converting files, you can pause, stop and continue at any moment. 9. With the user- friendly interface, OJOsoft WAV Converter is suited for both veterans and beginners you can complete your conversion as easy as 1-2-3. 10. All decoders and encoders are built in. Once you download and install OJOsoft WAV Converter, all supported formats can be converted without downloading any more codec. 11. Safe to install and viruses-free. We respect your privacy. So there are no spyware and adware in OJOsoft WAV Converter. convert your audio/video file to MP3 or WAV format. Qweas is providing links to OJOsoft WAV Converter 2.7.5 as a courtesy, and makes no representations regarding OJOsoft WAV Converter or any other applications or any information related thereto. Any questions, complaints or claims regarding this application OJOsoft WAV Converter 2.7.5 must be directed to the appropriate software vendor. You may click the publisher link of OJOsoft WAV Converter on the top of this page to get more details about the vendor.